7 June 2017, at 6:01a.m. US - In April, US red meat exports slowed moderately from the red-hot pace established in March but were still significantly higher year-over-year, according to statistics released by USDA and compiled by USMEF. Pork exports followed a record-breaking March with a solid April performance, reaching 203,091 mt – up 8 per cent from a year ago and the largest April volume on record. Export value was up 11 per cent to $517.5 million. For January through April, pork exports increased 15 per cent in volume (830,738 mt) and 19 per cent in value ($2.1 billion). Pork exports as a percentage of US production continued to run well ahead of last year, as April exports accounted for 28.4 per cent of total pork production and 23.5 per cent for muscle cuts only – up from 26.2 per cent and 22.1 per cent, respectively. Through April, exports accounted for 27.5 per cent of total pork production and 22.8 for muscle cuts (up from 24.4 per cent and 20.5 per cent last year). Export value per head slaughtered also trended much higher than a year ago – averaging $55.39 for April (up 11 per cent) and $53.12 through April (up 16 per cent). “While April was a very solid month for US red meat exports, we remain in an extremely competitive situation across the world and must stay aggressive with our marketing efforts,” said Philip Seng, USMEF president and CEO. Mexico continued to solidify its position as the largest volume destination for US pork as April exports were up 10 per cent from a year ago in volume (58,828 mt) and exceeded $100 million in value for the 12th consecutive month ($104.7 million, up 12 per cent). Through April, exports to Mexico were 24 per cent higher than a year ago in volume (265,090 mt) and up 34 per cent in value ($476.6 million). April pork exports to leading value market Japan were steady with last year’s volume at 32,552 mt and 2 per cent higher in value at $129.5 million. Through April, exports to Japan remained 5 per cent higher than a year ago in volume (134,133 mt) and were up 10 per cent in value ($540.8 million). Japanese import data indicate that Canada continues to aggressively pursue Japan’s high-value chilled market, with imports from Canada (53,220 mt) running 19 per cent ahead of last year’s pace while chilled imports from the US were up 2 per cent to 71,228 mt. As China’s domestic pork production rebounds, US pork muscle cut exports to China/Hong Kong have trended below year-ago levels each month in 2017 (although exports in April were the largest this year). 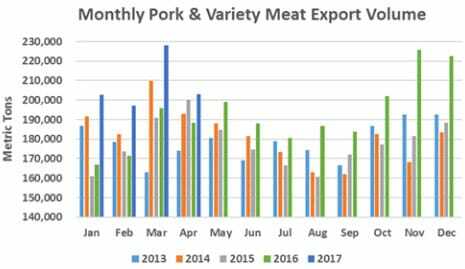 Exports of pork variety meat, however, have continued to outpace year-ago levels and helped offset much of the decline in muscle cut exports. For combined pork and pork variety meat exports, April volume was down 7 per cent to 48,457 mt but value was steady with last year at $96.7 million. For January through April, exports to China/Hong Kong were still 2 per cent higher than a year ago in volume (179,493 mt) and up 8 per cent in value to $355.5 million. This was driven by a 21 per cent increase in variety meat exports to 115,305 mt. These exports also commanded higher prices as value jumped 29 per cent to $239 million. Pork exports to South Korea continued their upward trajectory in April, climbing 21 per cent above last year in volume (14,585 mt) and 32 per cent higher in value ($41 million). Through April, exports to Korea were 28 per cent ahead of last year’s pace in volume (65,743 mt) and 37 per cent higher in value ($177.9 million). April pork exports to Australia were 11 per cent higher than a year ago in volume (5,485 mt) and 17 per cent higher in value ($16 million), pushing January-April results to 26,092 mt (up 31 per cent) valued at $73.8 million (up 36 per cent). Colombia led a very strong month for pork exports to Central and South America, with April exports to Colombia increasing 84 per cent from a year ago in volume (5,085 mt) and more than doubling in value ($12.2 million, up 118 per cent). Through April, export volume to Colombia was up 96 per cent to 21,617 mt while value jumped 104 per cent to $48.7 million. Bolstered also by a large increase in exports to Chile, export volume to Central and South America was up 45 per cent through April at 53,741 mt while value climbed 47 per cent to $127.8 million. April exports to the Philippines increased 91 per cent from a year ago in volume (3,430 mt) and soared 217 per cent in value to $9.2 million. This pushed January-April exports to the Philippines to 11,217 mt (up 14 per cent) valued at $28.3 million (up 42 per cent). Exports to the ASEAN region were 6 per cent ahead of last year’s pace in volume (12,907 mt) through April while value was up 28 per cent to $33.4 million. April exports to the Dominican Republic were up 53 per cent in volume (3,567 mt) and 73 per cent in value (just under $8 million). Through April, exports increased 29 per cent in volume (11,365 mt) and 38 per cent in value ($25.2 million).